Four double bedrooms, 6 roomettes and 6 open sections that double as lounge and dining space, and a shower. Galley for full meal service. Built for the Louisville & Nashville Railroad by Pullman-Standard in 1953 as the Plantation Pine for service on the L&N’s Pan American, the Humming Bird and Georgian, jointly operated by the L&N, Chicago & Eastern Illinois, and the Nashville, Chattanooga & St. Louis. Became L&N dormitory car 1661 in 1967. Retired in 1969 and sold to first private owner. 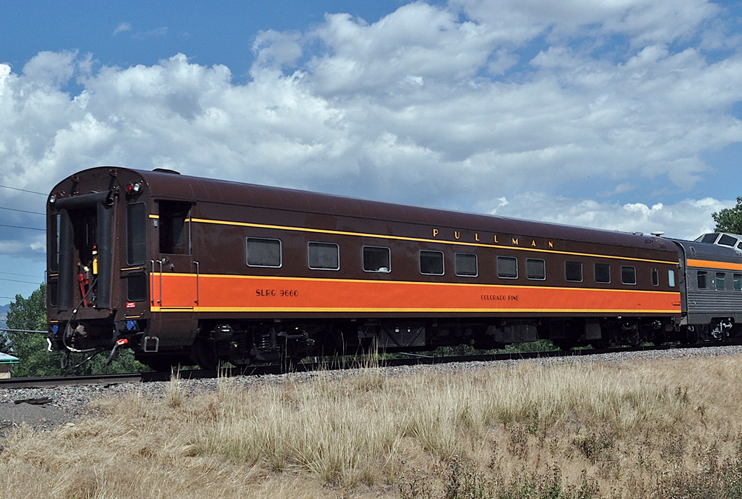 Acquired by former owner in 1989 and fully restored in 1989-2004 and renamed Colorado Pine. It was purchased in 2012 by Iowa Pacific Holdings.